The GrandWay S 109 is a classical folding knife made of high quality stainless steel with a mirror finish. It is a sturdy universal pocket folder and perceptibly heavy in hands. The blade has a jimping and the clip point shape and is sharpened on one side. The point that is created by this clip is lowered, which provides more control when using the knife. A "belly" area is perfect for slicing. The blade has a mirror polished surface and made of 440C steel which is resistant to corrosion and rust. The handle is 2 metal liners covered with rosewood plates and metal bolsters. The handle materials add a pleasant weight to the knife and make its grip very ergonomic and comfortable for everyday use. The folding knife has a simple, safe, strong and reliable back lock. The lock is very easy to handle and it copes quite well with the loads. All these features make of the S 109 model a good option for those who are looking for a reliable assistant not only for EDC use or picnics, but also for quite difficult hikes, camping, scouting, hunting, fishing and other outdoor activities. The benefits of this knife include reliable strength, safety and compactness. It won't occupy much space in your pockets or backpack. It is a very successful model and unfolds into a fully functional knife which is convenient for cutting as well as for survival and emergency situations. Such a knife could be the best gift for birthdays or any occasion to make nice to your friends, boys and guys. GRAND WAY is engaged in the production and development of knife projects (folding, hunting, tactical, souvenir, etc., with more than 1000 species.) under its own brand for over 15 years. 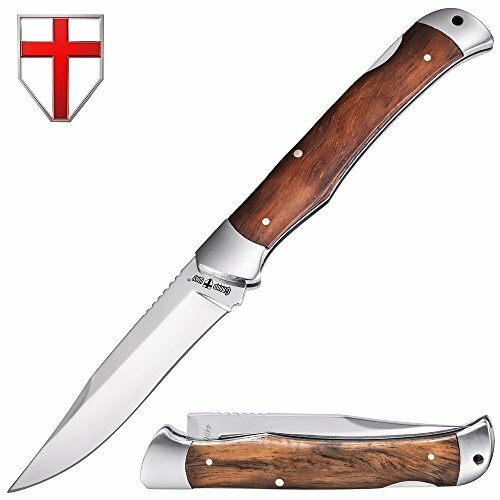 POCKET KNIFE WITH FOLDING CLIP POINT BLADE AND LANYARD HOLE FOR EVERYDAY CARRY has simple and reliable back-lock which is resistant to dirt and prevents unexpected closure. Equipped with a jimping for thumb control when cutting or using for any utility purposes. PERFECT KNIFE FOR EVERYTHING - Camping, Hiking, Backpack, Bushcrafting, Hunting, Fishing, Military & Army needs, Outdoor & DIY Activities, Survival, Self Defense, Emergencies. 440C STAINLESS STEEL - excellent balance of hardness and corrosion resistance ensures proper operation without sharpening. Provides razor sharp cutting performance and high durability. The best knife in your camp or hunt knife set. ERGONOMIC METAL HANDLE with wood plates protected with bolsters on both sides for comfortable and stiff grip. A great tool of high quality and sturdy materials for professional and tourism lover alike.